I'm never at a loss for inspiration when it comes to cooking and baking. Besides reading and editing recipes all day every day at work and reading numerous food blogs, I subscribe to a whole bunch of food sites so I'm constantly bombarded with emails from them with new recipes to try. The other day I got one of these emails from Real Simple; it featured a quick and easy recipe for pasta with turkey and broccoli. Something about the picture sucked me in, and pretty soon I was tweaking the recipe in my head and making a mental shopping list. The dish looked like it could end up being a little dry (there was only oil used to moisten it), so I figured some crushed tomatoes would fix that (and enable me to cut some of the oil). I also wanted to add another veggie and chose to throw in an orange bell pepper. I haven't gotten Jeff into ground turkey yet, so I swapped in some ground pork instead. For extra flavor, I added an onion. In the end we had a pasta dish that was still quick and easy to make but turned up a notch with lots of veggies and flavor. Cook orecchiette according to package directions. Drain and return to pot. Stir in crushed tomatoes, and set aside. Steam broccoli for about 3 minutes. (You can also throw the broccoli in with the pasta during the last minute of cooking. I preferred steaming the broccoli so I could be sure it would stay crisp.) Set broccoli aside. Meanwhile, heat oil in large skillet over medium-high heat. Add onion, and cook for 1 minute. Add bell pepper, and cook for 1 additional minute. Add pork and cook, breaking up with a spoon, for 3 minutes, then stir in garlic. Continue cooking until pork is no longer pink. Season with salt and red pepper flakes. Transfer orecchiette to a large bowl, and toss with pork mixture and broccoli. Serve with Parmesan and season with salt to taste. I am seriously itching for spring and summer produce right now. A couple weekends ago, I convinced Jeff we should head over to Ward's Berry Farm in Sharon, Mass., to see what they had. Of course we got there and they didn't have much on the shelves yet--it's still a bit early. I did manage to find some arugula, and I made a simple salad with it that will hopefully tide me over until the shelves are overflowing with freshly picked produce. To make the salad, I simply washed and dried the arugula and placed it in a large bowl. I topped it with thinly sliced red onion. Then I squeezed some lemon over the greens and drizzled in some olive oil. I tossed the greens, topped them with quartered cherry tomatoes and shaved Parmesan cheese, and seasoned the whole thing with a little kosher salt. It definitely made for a light, springy salad. We had it along with some grilled pesto chicken and veggies. What produce are you most looking forward to finding at your local farm stand or farmers' market? Happy Monday! I hope you all had a good weekend. I was in Connecticut all weekend for my cousin's fiancee's bridal shower. It was a lot of fun and I got to catch up with some extended family members I haven't seen in a while, but between the festivities and all the driving, I'm already ready for another weekend! Ok, I'm obsessed. I first tried the Raspberry Fudge Chunk flavor and was immediately hooked on the tangy frozen yogurt. I love the large chunks of chocolate too. It's gotten to the point where I plan to go to the store just to get my Greek frozen yogurt fix, and then we do some other grocery shopping while we're there. I've also tried (and really like) the Strawberry Shortcake one and plan to try the other two flavors (Peanut Butter Banana and Blueberry Vanilla Graham) as well. I make myself take four days to eat a pint, even though I really want to finish it all in one sitting! I take a KIND bar to work with me almost every morning. I usually just pick a few different flavors out every time I go to Whole Foods, and I've loved all the ones I've tried so far. They all taste amazing, have a great texture, and keep me feeling full. My favorites are definitely Dark Chocolate Peanut Butter + Protein and Dark Chocolate Cherry Cashew + Antioxidants (are you seeing a theme here?). I've recently discovered that KIND makes granola too, though I've yet to come across it in stores. You can bet I'll be trying it if I ever manage to find it. I probably don't talk about it often enough here, but I absolutely love my Nespresso machine. Jeff and I treat ourselves to lattes and macchiattos on the weekends--when we don't have to quickly throw back a cup of coffee and get to work. We have flavored syrups and caramel so we can really go all out if we want. Jeff usually makes a caramel macchiatto, and I usually make lattes with Silk vanilla soy milk. Nespresso recently sent me samples of a new limited edition flavor called Naora. I tried it on its own and found it to have a bitter edge that gave way to juicy, sweet berry flavors. I love that Nespresso is always coming out with new flavors. It took me a while to get on the coconut water bandwagon, and even now, Zico's passionfruit flavor is the only one I truly enjoy drinking (and the most difficult flavor to find--just my luck). And this may sound weird, but I also prefer drinking it through a straw. While I'm not going to comment on whether the claims about coconut water are true, I will say it definitely makes me feel better if I drink it on mornings after I've had a couple of glasses of wine with dinner. It just gets rid of that grogginess and makes me feel really hydrated. Last time my mom and I went to Freeport, Maine, we tried to chart out how long we've been going to Freeport, how many times we've been there, how many different bed and breakfasts we've stayed at there, and how many times we've stayed at Brewster House Bed & Breakfast. Our estimate was that we've been going to Freeport since 2000, the first visit being right after we moved all my stuff into my dorm at UConn my sophomore year. Since then we've gone up there one to three times each year, so we know we've gone at least 12 times but definitely more than that. We jotted down the names of all the B&Bs that popped into our heads: Three Sisters, Captain Brigg's, White Cedar Inn, The James Place Inn, and a few others, and we knew we'd stayed at the Harraseeket Inn as well, though that's not a B&B. In 2008, we found Brewster House Bed & Breakfast and our B&B hopping ended. Since then we've gone back every year, sometimes more than once a year. Innkeepers Ruth and Scott Thomas purchased the B&B in 2006 and have since provided a clean, cheerful, welcome space. Over the years we've gotten to know them and feel so comfortable staying with them that their B&B is like a second home to us. We've stayed in a number of different rooms there, and this time we revisited the Cape Elizabeth room, which is right on the first floor and features cheerful yellow walls and and floral decor. The rooms have changed over the years as Ruth and Scott find things they think their guests will appreciate. Electric tea pots and mattress pads as well as flatscreen TVs are some of the newer additions we've noticed. After a great night's sleep in our comfortable room, we awoke, got ready for our day of outlet shopping, and headed into the bright, cheery dining room for breakfast. Soon after we settled in at a table by the window, Scott came over and offered us tea. Scott and Ruth are always working to make things better for their guests and this time they were brewing loose leaf tea in addition to offering an array of tea bags to choose from. We opted for a pot of the Earl Grey loose leaf tea. Scott also poured us some juice. I went with the blueberry-pomegranate, and my mom had some of that mixed with orange juice. We learned on this visit that Ruth keeps a file and notes what she serves us each time we come so we'll never get the same breakfast twice. This time she decided to try a new recipe on us: Merlot-poached plums with vanilla cream. We really enjoyed starting the meal with the sweet, soft plums and dollop of cream. Ruth asked us if we liked the plums and if there was anything she should change. I thought a little something crunchy on top (like granola or some sort of streusel) would take them over the top--maybe I was looking for a way to eat plum crisp for breakfast. The main course was a leek and ham frittata, crispy bacon, and roasted asparagus. I thought the frittata was just wonderful, fluffy but not wet, with the right amount of cheese and filling ingredients. The bacon was crispy like I like it, and the asparagus was also done just right. The breakfast fueled us for a day of shopping the Freeport outlets, getting pedicures, and going out to the movies. Then we spent another comfortable night at the inn. In the morning we were treated to another one of Ruth's amazing breakfasts. We started with fresh fruit pavlovas. The crisp meringues just melt in your mouth and the fresh fruit and sweet cream are welcome complements. The pavlovas were followed by caprese eggs, crispy bacon, and Bourbon French toast with maple-rum sauce. I found the caprese eggs really interesting. They were like baked poached eggs with mozzarella, basil, and tomatoes. The flavors were fantastic. I'm not a huge fan of anything with a bread pudding-like texture, and this Bourbon French toast bordered on being a little too soft for me, but I couldn't stop eating it because the flavors were so wonderful. I especially loved the sweet maple-rum sauce. 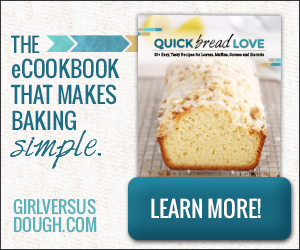 Ruth and Scott recently put together a cookbook of Ruth's favorite recipes called Breakfast at 8. We couldn't leave without picking up a copy, and I'm really excited to make some of her great breakfast dishes at home now. Those pavlovas are definitely on my list, as are a spinach and feta frittata and cranberry-orange scones. Oh, and there are cookie recipes in the book too because Ruth always makes cookies that she leaves out for guests to snack on in the afternoon and evening. We usually grab a couple when we get back from shopping. She had some delicious white chocolate cranberry ones out during this visit. Because we've been staying at Brewster House Bed & Breakfast for so many years, I can easily recommend that you check it out if you're ever looking for a place to stay with friendly hosts and amazing breakfasts in the Freeport area. And if you've never been to Freeport, I assure you it's a great town to visit, and I know Ruth and Scott can make some great recommendations for things to do and places to eat in the area. There are so many people doing amazing things out there, but I just wanted to tell you about some of my friends whom I am really proud of and who I know would appreciate your support. 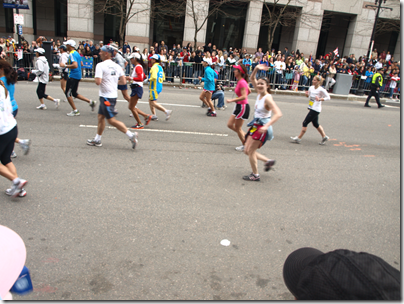 Meghan of Travel, Wine, and Dine is running the Boston Marathon today! This will be her third Boston Marathon, and she is running to raise money for the ALLY Foundation. You can read more about it over on her fundraising page. I know Meghan has been working really hard to raise money for the ALLY Foundation through fundraisers and other promotions, and I know she's also been training hard for the marathon. I can't even imagine running a marathon. I get up to 5 miles and that's good enough for me. I'm really proud of Meghan and excited for her, and I wish I had the day off so I could go cheer her on. If you see her on the course, make sure to cheer nice and loud! And don't forget, there's still time to support the ALLY Foundation. Elina of Healthy and Sane took a gigantic leap and quit her job last year. She wasn't sure what she was going to do next, but after volunteering at Cooking Matters and helping out with classes, she figured out that she wanted to teach people how to cook and eat more healthfully. She just started her own business called Satisfied Cravings. She'll be holding private or semi-private lessons at her Back Bay condo. Her hope is that people in the area will want to come in during their lunch breaks to make a healthy meal for lunch and a dinner to take home. I've had Elina's food before, so I know it's good. She'd be a great person to learn from. If you're interested in learning to eat better meals and make the most of your lunch break, head over to Satisfied Cravings to check it out! Jen of Beantown Baker and Fiona of A Boston Food Diary have teamed up to participate in the Avon Walk for Breast Cancer, a two day walk spanning 39 miles in May. These ladies have committed to raising $2,000 each for the Avon Foundation. Jen has made breast cancer awareness part of her personal mission. In 2004, her mother was diagnosed with breast cancer at a young age. Since then, she and her family walk the Race for the Cure every year. She has raised nearly $5,000 since 2010 by participating in the Avon Walk for Breast Cancer. Fiona has watched countless friends stand strong as their family members, or themselves, have battled this disease. Wishing she could do more, but never knowing what to do, this year, as another friend's mother has entered into this fight, she decided to join Jen in her walk to find a cure. Please help support them by participating in their blogger bake sale. 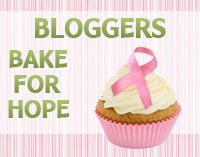 You can find more information and register to bake over at Bloggers Bake for Hope! Do you know any other bloggers who are doing amazing things? Feel free to give them a shoutout here! I do not claim to have any sort of skills when it comes to grilling; it's actually one of the cooking methods I'm least familiar with. But since we're living with Jeff's parents and they've got a grill and grilling seems to be a quick and easy way to get to dinner on the table (not to mention that it keeps the kitchen clean), I've been giving it a try. I decided to start small. Jeff made burgers a couple nights, and the first time he did, I laid some asparagus spears on a piece of foil, drizzled them with olive oil, seasoned them with salt and pepper, and placed them on the grill along with the burgers. A little while later, we had nicely charred, flavorful asparagus to go with our burgers. The next time I got a little more adventurous and tossed some mini peppers and onion slices with olive oil, salt and pepper, and a little garlic powder. It was another success. Then I decided to make mini peppers again, this time with wedges of Vidalia onion, salt, pepper, and olive oil. I put the mixture on a sheet of foil again. At some point I'm thinking I'll be brave enough to put veggies right on the grill grate, but I'm not quite there yet. Once the grill was good and hot, I set the pork on one side and the veggies on the other. I flipped the pork after the bottom side got charred and then cooked it a little longer before transferring it to a plate to rest. Some of the pieces were perfect and some were just about a minute overdone--I'll have to work on that--but they were all well seasoned and still juicy. The veggies took a little longer, and I tossed them with tongs occasionally to get charring on all sides. I was pretty pleased with the final outcome. Do you grill? What do you like to make? I really want to try making grilled pizza. The week after we moved, we were exhausted. (It took us all week to get our bed frame set up.) Luckily Jeff's mom cooked dinner for us most nights, and a package of Wicked Good Cupcakes' Wicked Good to Go jars arrived at the house. There's nothing like dessert being delivered to your door when you're too tired and rundown to even think about making it! Inside the package I found three different Wicked Good to Go jars, complimentary samples sent to me by Wicked Good Cupcakes. The bakery, which was started by a mother-daughter team, specializes in these jars, which are filled with cake, buttercream, and a range of other fillings or edible decorations. The flavors I got to try were Cuckoo for Coconut, Chocolate Lab, and Chocolate Guinness & Bailey's. I shared the cupcakes with Jeff and his parents, so after dinner the night after the cupcakes had arrived, we broke into them, and each spooned some of each flavor onto our plates so we could try them all. (The jars also come with spoons so you can just eat right out of the jar if you're not sharing.) I was surprised at how moist the cake was in each of the jars. The frostings were all rich and flavorful without being unbearably sweet. The Chocolate Lab features chocolate cake with chocolate ganache, chocolate cream cheese buttercream, and chocolate sprinkles. This was a solid chocolate cupcake, and we all liked it. Jeff's dad, who might even love chocolate more than I do, was enamored with it. The Chocolate Guinness & Bailey's, which would have been perfect for St. Patrick's Day, was definitely the frontrunner for the rest of us. This jar contains chocolate cake baked with Guinness Extra Stout and Bailey's Irish Cream-infused cream cheese buttercream frosting, along with some chocolate sprinkles and buttercream. The sweet Irish Cream buttercream is nicely balanced by the dark chocolate cake. The Cuckoo for Coconut was good but not a favorite. This flavor has vanilla cake, cream filling, organic coconut flakes, and coconut buttercream frosting. It was tasty but I couldn't help thinking how much better it would be with toasted shredded coconut as opposed to the big flakes. I also thought it had too much of a tropical taste, maybe from coconut extract. If you like a big hit of coconut flavor though, you'll definitely love it. The jars come in so many different flavors. The new Spring Fever looks bright and cheery and absolutely perfect for spring, with layers of vanilla cake and buttercream and spring-themed sprinkles. And I know I'm going to have to try the Peanut Butter Surprise at some point. These jars are a really cute way to ship cupcakes. If you know someone who's celebrating a birthday or you want to send a tasty thank-you gift, you might want to head over to Wicked Good Cupcakes' website and check out all the flavors and package options. The jars can be shipped nationwide, come in two different sizes, and last 7 to 10 days without refrigeration. I'm hoping I'll be able to get to Cohasset soon to try Wicked Good Cupcakes' regular cupcakes too. These cupcakes in a jar were complimentary and sent to me by Wicked Good Cupcakes, but my opinions are my own. What sort of food gifts do you like to give... or receive? Our wedding is just 6 months away! I've been wading through all the checklists trying to stay on top of everything we need to do. During the past month, we've really been tackling finding somewhere to have our rehearsal dinner. We're getting married in Beverly, and I'm not super familiar with the area. Luckily, Jeff's aunt and uncle live nearby, and they've been more than happy to dine at some restaurants for us and give us their feedback. We went with them to try Brutole in Danvers, but I didn't take any pictures that night. While we enjoyed the food, we were up in the air on the atmosphere. The restaurant doesn't have a private room or event space, so we'd be tucked in a corner of the restaurant right by the door. We looked at some other places in the area too but just didn't get the feeling we were hoping for. I checked in with my venue, and the wedding coordinator there suggested we try 43 Church in Salem. I scanned the menu and thought it sounded like my kind of restaurant. Jeff and I made an appointment with the event coordinator there, made a reservation for dinner, and headed up there on a Friday after work. We met with the coordinator, went over event menus, and toured the event space. The upstairs of the restaurant features lots of private space in the form of a big open room with rustic wood floors and a fireplace. The space feels historic and cozy. We loved what we saw and stayed to have dinner back downstairs in the restaurant. We each ordered a glass of wine (Riesling for Jeff, Malbec for me) and nibbled on fresh bread and the most wonderful butter (doctored up in house with salt and chives). We shared a bowl of French onion soup, and by shared, I mean I got to eat all the bread. Jeff loves French onion soup but not the crouton... more for me! We both liked this one but didn't find it as beefy and full flavored as some others we've had. I had my eye on the wedge salad (one of my favorite salads to order at a steak house) from the moment I first scanned 43 Church's menu, so I had to order it. I loved how the wedge was cut into slices. This is how I typically make a wedge salad at home, but usually it's served in an intact (difficult-to-eat) wedge at restaurants. The bacon was crisp and the blue cheese creamy. Jeff got a Caesar salad (one of his favorite salads to order just about anywhere). Going with my new favorite cut, I ordered the rib eye cooked medium-rare for my entree. 43 Church gives you the option to choose an accompanying sauce, and I went with a wine sauce. The steak was so flavorful it didn't even need the sauce. Jeff chose the NY sirloin, which was suggested to us as one of the most popular rehearsal dinner options. I knew he wouldn't want a creamy sauce (like Bernaise or horseradish), so I talked him into the house steak sauce, which ended up being tangy and bright. And we shared an order of garlic mashed potatoes (amazing). My steak was better... but how could it not be with all that buttery fat to give it flavor? We decided we'd definitely go with the rib eye for a rehearsal dinner option. I rarely leave anywhere without having dessert or at least looking at the dessert menu, so I took a glance at one, and as I was reading all the options, I saw something called Chef's Dessert Board. I asked our waiter about it, and he confirmed my suspicions: It was indeed a sampling of many of the desserts on the menu. That was all I needed to hear. This is Jeff's are-you-done-taking-pictures-can-I-eat-dessert-already face. He's a good sport. I think we fought over the chocolate cake most. It was so warm, soft, and gooey and clearly went perfectly with the malt ice cream. I could do without the cookies, but I enjoyed the dense, rich cheesecake with tangy raspberry sauce and the cinnamon-y sweet apple ravioli. We had a great evening and just booked 43 Church for our rehearsal dinner. I'm so happy to have checked something else off the list! Have you been to any great North Shore restaurants?